North Woods of Colchester is Southeastern Connecticut's award winning Active Adult 55+ community. Our neighborhood offers detached Single Family Homes on individual lots with easy access to Shopping, Transportation Facilities, Recreational Activities, Fine Dining, Quality Cultural Opportunities and the Connecticut shoreline. Colchester is known as: "The Right Town Between Work and Play!" Colchester is located in Southeastern Connecticut, approximately 25 miles Southeast of Hartford and approximately 25 miles North of the Connecticut shore. The town has an area of 48.7 square miles with 3,300 acres of state forest, parks and wildlife preserves with an additional 627 acres of town owned land. Colchester is located at the gateway to one of the most explosive recreation areas in the Nation, which includes Foxwoods Resort Casino, Mohegan Sun Resort Casino, Mystic Seaport, Mystic Aquarium and the Connecticut and Rhode Island shorelines. The Goodspeed Opera House, The Bushnell, The Hartford Stage Company along with dozens of other quality cultural and entertainment opportunities are all with in a 30-minute drive. Major transportation facilities include Bradley International Airport, which is a 40-minute drive North and the New Amtrak Rail Station, located within the town of Old Saybrook, located within 20 miles. There is Amtrak service, to points North, including Boston, Providence and points South including Stamford and New York City. Call us today at 1-860-537-5338 or 1-860-707-4353 to find out more about this exciting community! 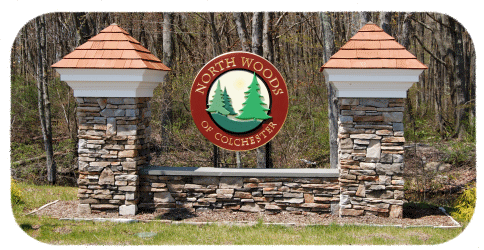 The North Woods of Colchester neighborhood design consists of 140 detached homes on individual lots built on our 78-acre site, which preserves 37 acres of dedicated open space. Now completing the 5th and final phase, this private neighborhood includes underground utilities, street lights, sidewalks, and landscaped common areas. The site plan has been designed to create small neighborhoods linked by a series of gently winding roads which culminate into cul-de-sacs in four locations. Each home is positioned for optimal solar orientation and topography, along with privacy and exposure to the natural setting. These Energy Star rated homes are constructed to maximize energy efficiency and minimize owner expenses. There are 10 fully customizable models to choose from, with prices starting at $299,000, and sized from 1100 to over 3,000 square feet, including many high quality features as standard. All models offer features including: attached garages, full basements, first floor master suites with walk in closets and en suite master bath, 9 foot ceilings, Andersen windows, solid core doors, hardwood floors, ceramic tile, maintenance-free decks, granite countertops, and designer kitchens. Each home reflects the unique personality and taste of the owner with distinctive enhancements. No two homes are identical. Customizations can include finished walk-out basements, sunrooms, and optional second stories. The distinctive exterior style of our homes feature cultured stone accents as well as shingle and clap-board siding. With careful attention to detail, the builder Alan D. Williams proudly creates a combination of quality, flexibility, and customization in every home he builds. The staff includes the talents of their own architect, and an onsite interior designer. North Woods is truly a thriving and vibrant community providing a comfortable active lifestyle to homeowners over 55. The neighborhood provides “maintenance-free living”, including all snow shoveling, raking, mowing, and landscape maintenance. While some can enjoy this atmosphere while still in the workplace, others can truly retire and spend more time with family and friends. As Bill F. puts it so well.. ”I’m real happy with living at North Woods. We’ve come up with a motto that “Every Day is Saturday”. Located in Colchester, Ct, North Woods is a strategic point between Massachusetts and New York, and eastern or western Connecticut. It is easily accessible to route 2, and is a 30 minute drive to Hartford or the Connecticut shoreline. Major transportation facilities include Bradley International Airport, which is a 40 minute drive north, and the new Amtrak rail station located within 20 miles in the town of Old Saybrook.